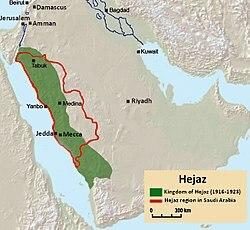 The new kingdom had a brief life and then was conquered in 1925 by the neighbouring Sultanate of Nejd under a resurgent House of Saud, creating the Kingdom of Hejaz and Nejd. On 23 September 1932, the Kingdom of Hejaz and Nejd joined the Saudi dominions of Al-Hasa and Qatif, as the unified Kingdom of Saudi Arabia. In their capacity as Caliphs, the Sultans of the Ottoman Empire would appoint an official known as the Sharif of Mecca. The role went to a member of the Hashemite family, but the Sultans typically promoted Hashemite inter-familial rivalries in their choice, preventing the building of a solid base of power in the Sharif. With the outbreak of the First World War in 1914, the Sultan, in his capacity as Caliph, declared a jihad against the Entente powers. The British in particular hoped to co-opt the Sharif as a weighty alternative religious figure backing them in the conflict. The British already had a series of treaties with other Arab leaders in the region and were also fearful that the Hejaz could be used as a base to attack their shipping to and from India. The Sharif was cautious but, after discovering that the Ottomans planned to remove and possibly murder him, agreed to work with the British if they would support a wider Arab revolt and the establishment of an independent Arab kingdom — the British implied they would. After the Ottomans executed other Arab nationalist leaders in Damascus and Beirut, the Hejaz rose against and soundly defeated them, almost completely expelling them (Medina remaining under Ottoman control throughout). In 1916, the Sharif of Mecca Hussein bin Ali declared himself King of Hejaz as his Sharifian Army participated with other Arab forces and the British Empire in expelling the Turks from the Arabian peninsula. The British though, were compromised by their agreement to give the French control of Syria (comprising modern-day Syria and Lebanon) and did not, in Hussein's eyes, honour their commitments. Nevertheless, they did eventually create Hashemite-ruled kingdoms (in protectorate form) in Jordan and in Iraq, as well as Hejaz. Hussein refused to conclude a treaty of friendship with the British, who then later chose not to intervene when another British client, Ibn Saud invaded and conquered Hejaz. ^ Al-Rasheed, M. A History of Saudi Arabia. Cambridge, England, UK: Cambridge University Press, 2002. This page was last edited on 30 March 2019, at 12:02 (UTC).